The Yale iGEM Team competed at the iGEM World Championships at MIT in November 2011. From left to right: Chidi Akusobi, Aaron Hakim, Aaron Lewis, Darren Zhu, Alexander Li, Kara Bower, graduate adviser Jen Nguyen, Durga Thakral. Photo courtesy of Aaron Hakimtias. In 2003, the International Genetically Engineered Machine (iGEM) started as a summer course at the Massachusetts Institute of Technology (MIT). Since 2004, it has grown into an international competition that challenges undergraduates from many disciplines of science and engineering to design new biological systems using pieces of DNA called BioBricks and run them in live cells. New BioBricks are made by each team and incorporated into the database each year. “The competition,” explains Aaron Hakim ’13, one of the current Yale iGEM members, “is based on the idea of synthetic biology – treating DNA as genetic software.” Each participating team designs and carries out a project over the course of a year and presents their results at an annual conference. The competition has grown tremendously from only five competing teams in 2004 to over 160 teams in 2011 – and Yale has joined in on this phenomenon with the recent creation of our own iGEM team at Yale. The Yale iGEM Team was conceived during the 2009-2010 academic year when Jon Russell ’11 expressed interest in organizing a group of undergraduates to study biology-inspired engineering. In its first year the team learned to navigate the iGEM infrastructure and worked on creating bacteria that could produce an electrical circuit. After this start, three of the team’s original members, Darren Zhu ’13, Kara Bower ’13, and Chidi Akusobi ’12, continued with iGEM into 2011. In January, they started meeting with new members to brainstorm ideas for the coming summer. The team became interested in antifreeze proteins, which are crucial for organisms living in sub-zero temperatures because if ice formation is left unchecked, crystals can quickly grow and burst cells open. 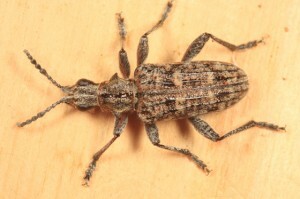 In May, the team decided to focus on Rhagium inquisitor, the Siberian beetle, which, according to Zhu, produces “the most active antifreeze protein discovered in nature.” As a self-sufficient team, the members then worked to secure funding, which was procured mostly from the Raymond and Beverly Sackler Institute, and made contacts with graduate student mentors and labs. Hakim and Zhu worked full time over the summer to express RiAFP in E. coli and describe its properties, while five other students worked part-time to help with specialized parts of the project. During their experimentation, the team members used a RiAFP gene synthesized by Integrated DNA Technologies. “We put it into E. coli and found that the protein was reasonably happy and stable,” Hakim. They subsequently produced the protein en masse and tested it to ensure that there was no loss of function. Ice crystallization assays demonstrated that the protein would successfully prevent crystal growth, and bacteria that were frozen with RiAFP showed a threefold increase in survival rate. In addition, rat liver tissue sustained less damage when frozen with RiAFP, while tissues frozen without the antifreeze protein demonstrated more cell death and damage. With verified confirmation of the protein’s antifreeze activity, the team then began to tackle the protein structure to elucidate the mechanisms of ice binding. After purifying RiAFP from other cellular components this summer, the team is now trying to determine the structure of the pure protein by X-ray crystallography. But the journey does not stop at characterization. In the team’s latest, most exciting experiments, members hope to make their antifreeze protein “superactive” by accelerated evolution. Multiplex Automated Gene Engineering (MAGE), a technology developed by their faculty advisor, Yale Assistant Professor of Molecular, Cellular, and Developmental Biology Farren Isaacs, allows them to alter multiple locations on a gene at once. MAGE mutants can then be tested for activity to see whether any of the mutations enhance the protein-to-ice binding strength. So far, the team has produced 434,000,000 different varieties and will test them for any possible super proteins. This past November, the team was recognized for its remarkable accomplishments at the 2011 iGEM World Championships. The team was tied for first place in the “Food and Energy” category and named among the top 16 teams in the world. Achieving such success in only its second year, the team strives to continue this track record and rise in the overall rankings in the future. Interested in joining the team? Contact any member of Yale iGEM by email (first.last@yale.edu)!